This allows the doors and the boot to be locked or unlocked. If one of the doors is open, the doors are not locked. 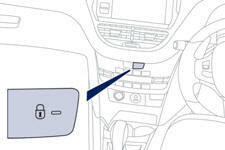 When the vehicle is locked or deadlocked from outside, the switch does not operate. After deadlocking, you have to use the remote control or the key to unlock the vehicle. The doors can lock automatically while driving (speed above 6 mph [10 km/h]). To turn this function on or off (on by default). press and hold the button until there is an audible signal and/or a message in the screen.